Neil Boyd put together an excellent guide for integrating IntenseDebate with Sandvox. 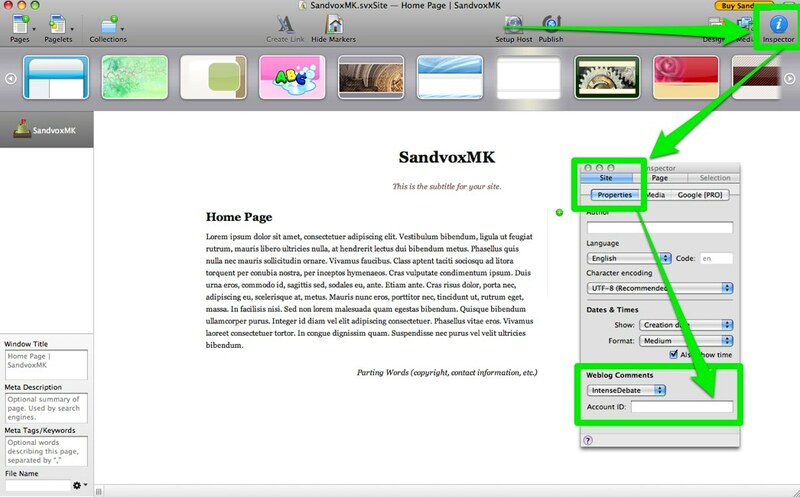 Sandvox is a do-it-yourself web site builder for Mac OS X (10.4.11, 10.5, or 10.6). Create your account. Visit http://intensedebate.com/install > enter your URL > and select our Generic Install option. Locate your IntenseDebate Site Account ID. Go to http://intensedebate.com/sitekey select your site from the list > your Site Account ID is located at the bottom. Add your Site Account ID in Sandvox. In Sandvox, select Inspector > Site > Properties > and then paste your IntenseDebate Account ID. And you’re all set! Make sure you check out all of your IntenseDebte account settings at http://intensedebate.com/editacct. Tags: Generic Install, install, platforms, Sandvox — Can't find your answer here? Let us know.